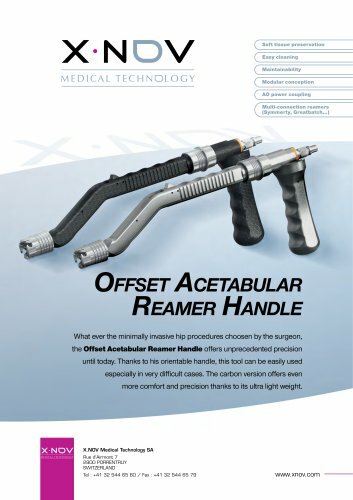 Soft tissue preservation Easy cleaning Maintainability Modular conception AO power coupling Multi-connection reamers (Symmerty, Greatbatch…) Offset Acetabular Reamer Handle What ever the minimally invasive hip procedures choosen by the surgeon, the Offset Acetabular Reamer Handle offers unprecedented precision until today. Thanks to his orientable handle, this tool can be easily used especially in very difficult cases. The carbon version offers even more comfort and precision thanks to its ultra light weight.